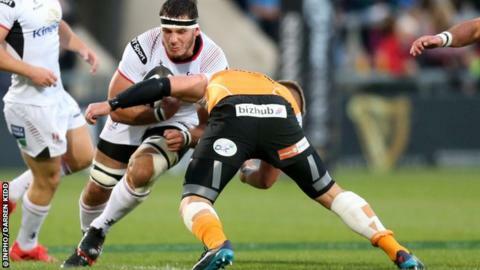 Ulster's South Africa forward Marcell Coetzee is facing another nine months out injured after further knee surgery. The flanker returned to South Africa, for whom he has 28 caps, this month for treatment on a problem that has restricted his appearances for Ulster since his arrival in Belfast in 2016. The province say Coetzee, 26, has had revision surgery on his left knee, which has a nine-month recovery period. His only appearance this season was in the Pro14 opener against the Cheetahs. Ulster said Coetzee has had "recurrent left knee problems because of a laxity in his previously repaired ACL and to repair this he has had revision surgery performed on this ligament". Coetzee's contract at Ulster runs until the end of the 2018-19 season and he is now expected to return for pre-season training next summer. "First and foremost, this is a massive blow for Marcell himself and we are all devastated for him," said Ulster's Director of Rugby Operations Bryn Cunningham. "We were hoping he was going to have a massive impact for us but he has only played five games - that's not his fault, it's nobody's fault." Meanwhile Chris Henry sustained a trauma to his larynx in last weekend's victory over Connacht at the Kingspan Stadium but it is hoped he will be fit for selection next week. Alan O'Connor sustained a concussion in the game last Friday and is following return-to-play protocols this week. Scrum-half David Shanahan tore his right hamstring playing for Ballymena last week and will be unavailable for the next three to four weeks while Roy Lyttle suffered a right shoulder injury playing for Banbridge.